Need Less Costly Dog Food Alternatives, Homemade Dog Food, etc - Please Help! 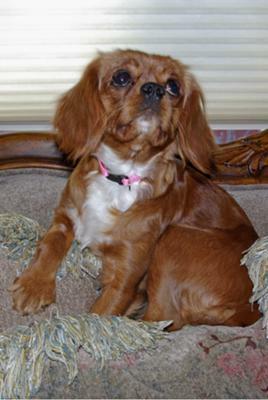 Hi there - We recently adopted a very sweet 2 yr. old Cavalier King Charles Spaniel. She is 15 lb. and the whole debate about what dog food to feed has sent my head spinning! After returning my first two choices of dog food back to the store after reading the articles on this and other sites, I decided on feeding her Wellness. The only down-side to the food is it gets quite costly. Our family is on a tight budget right now and although we don't want our sweet little Sadie to suffer for it, I am wondering if there might be some safe budget-friendly alternatives out there. I am considering combining the Wellness with a half and half mixture along with a less costly dry dog food... but again I'm back to what will be the best and most cost effective without a lot of grains or by-products. I would also like to know about the possibility of making my own home-made dog food for her, but again would like to know what is safe and healthiest. She also seems to have a lot of issues with allergies, she is scratching all the time (no sign of fleas), so that will also need to be taken into consideration. Any thoughts, suggestions or recommendations are greatly appreciated! Your little fur baby looks too gorgeous! Yes, as you're finding out, unfortunately some premium dog foods can be quite pricey and it certainly adds up when you're on a tight budget. Have you ever considered purchasing dog food online? Online pet suppliers tend to be very competitive, and often have special promotions or dog food coupons that one normally doesn't see at the regular pet food stores. A heads-up regarding online pet supplies, though. Be sure you know how much the shipping fees are, as this can be a real deal breaker! See our Dog Food FREE SHIPPING List, where we've isolated all dog foods 3 Scoops and above. Incidentally, Wellness Dog Food is included on the list, and there's a good chance you'll find it's cheaper than you're paying now. In our opinion, Chicken Soup for the Dog Lover's Soul appears to offer the best value for money at the moment. Regarding allergies and itching, there can be a myriad of causes - from dietary to environmental - so it can be very tricky trying to get to the root of it. In order to rule out whether it's dog food related, you'll need to put her on a single source, limited ingredient, elimination diet. More info on dog food allergies here. We hope this helps, and a call-out to all our visitors - Please chime in if you have any other suggestions or tips for Kristina and for all dog lovers in the same situation! Comments for Need Less Costly Dog Food Alternatives, Homemade Dog Food, etc - Please Help! A BARF diet is really quite easy and reasonable to feed a small dog like yours. You can use mostly contents from your own fridge. If you are anything like me, you throw out a lot of food because you didn't get around to cooking it. That will likely be good BARF ingredients. I endorse a BARF diet whenever I can, as it is the best thing for your dog and really isn't that labor intensive. Hi there - I wanted to send you an update to my last question... I sincerely appreciate your response and began checking into Chicken Soup for the Dog Lover's Soul and in doing such, I discovered a new pet store in our area that sells only good, high quality pet foods and they turned me onto Merrick Whole Earth Farms food. Before purchasing, I came back to this website and did a little more research on the brand, ingredients, etc. I discovered Merrick to be a top "5 scoop" brand and was impressed that I could get such a good quality brand at a fraction of the cost. I was able to get a 3-4 month supply of dog food for the same price as 1 month of my previous food, so I decided to switch. Kristina & a happy puppy, Sadie!